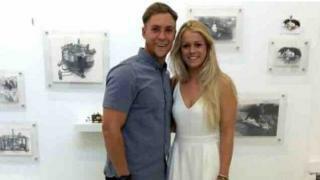 A funeral has been held for a British couple who died within hours of each other in Australia. Jason Francis, 29, was hit by a car in Perth on 22 December and partner, Alice Robinson, was later found dead. A joint service "of celebration and thanksgiving" was held at Telford Crematorium in Shropshire on Friday. Friend, Ian George, said: "They did more in the few years they were together than most people do in a lifetime." The couple, originally from Shropshire, moved to Perth last year. More than 44,000 Australian dollars (£22,175) was raised via a Go Fund Me Page set up by Mr Francis' Australian rugby team Cottesloe to help the couple's relatives with any costs associated with returning their bodies to the UK. Mr George, vice-chairman of Bridgnorth Rugby Club, said Mr Francis was a talented sportsman. "They were a very popular couple," he added. "I know their love for each other was obviously massive." He said: "Knowing what Jason was like, he wouldn't want everybody to be sad. "He was the sort of lad who would walk into a room and light it up with his presence." Inquests into both deaths are due to be opened on 28 February at Shirehall in Shrewsbury.